Add a few drops of your favorite essential oil or perfume on the Volcanic stone and enjoy the beautiful and beneficial fragrance. The Volcanic stone is a traditional stone that is used in many cultures around the world. It is thought to be calming and was often given to soldiers during battle. Volcanic stone are rich in minerals from deep below the Earth's surface. 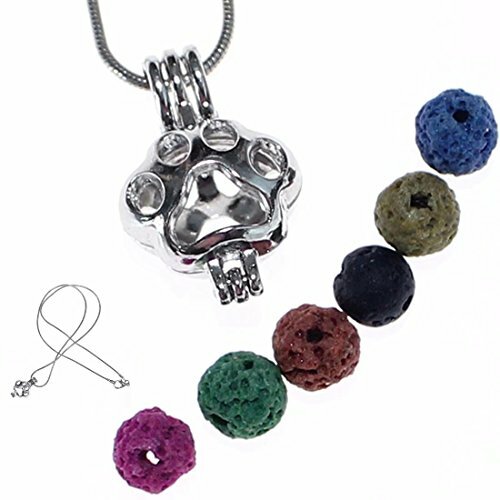 * Pendant - the paw pendant is 18kg plated and measures 5/8" wide and almost 3/4" tall with the bale. Remove the chain and open the pendant to add oil or perfume to the Volcanic stone. Since the chain runs through the bale, the locket is very secure and will not open accidentally. * Chain - dainty 18" (46cm) link chain with rhodium plating and lobster claw clasp. * Volcanic stones - very small 6mm natural volcanic stones in six different colors! They have an irregular and porous surface that allows the oil to soak in and last. The Volcanic stone is a traditional stone that is used in many cultures around the world. It is thought to be calming and was often given to soldiers during battle. Volcanic stone are rich in minerals from deep below the Earth's surface. If you have any questions about this product by KingFurt, contact us by completing and submitting the form below. If you are looking for a specif part number, please include it with your message.